Pattern consists mostly of charts with some written explanations.. 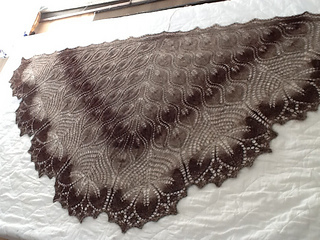 If you knit this in a heavier wool than Malabrigo (shown here as the grey shawl, shawlette size), you are more than likely to need more than 800 yards of yarn! 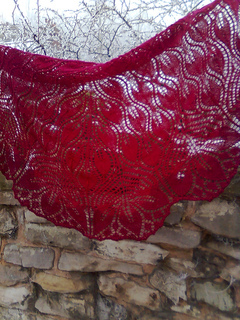 Instructions for a heavier shawl in pattern uses close to 900 m or 985 yards. 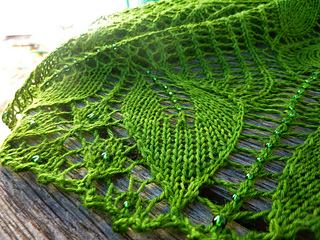 When knit in M&K Eco Wool, it took 12 balls of yarn with 2 repeats of chart 3. 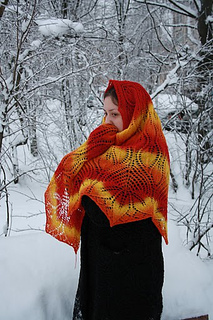 This shawl has a slightly rounded triangular shape. 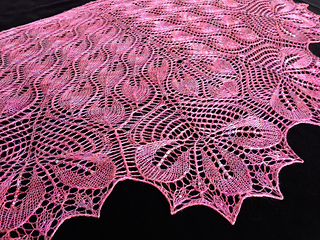 It is knit from the top down, meaning that you begin with a few stitches in the middle of the longest side, and end with the leafy edge and a million stitches to BO. It has the added charm of being reversible, as the WS is almost as interesting as the RS. Skill level: Intermediate to advanced. You will be reading charts backwards some of the way, most of the time keeping an eye on two charts at the same time. There are 6 charts in all, and they are very large. I would not call this a television project! 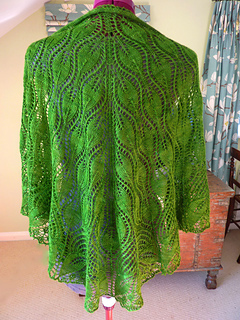 Also needed: stitch markers, scrap yarn and a crochet hook for the provisional CO. You could also invest in transparent sheets to print the charts on. That would make them easier to read backwards. You then simply turn the sheet over when you need to read it backwards, and the pattern is reversed for you. You need 3 transparent sheets for this. 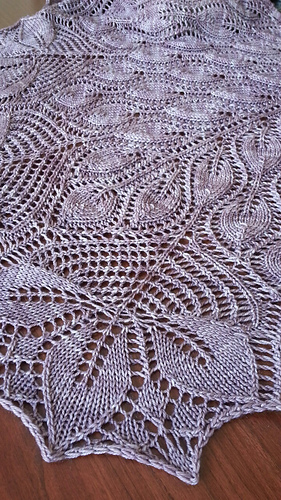 Special techniques used in pattern: provisional (crochet) cast on. 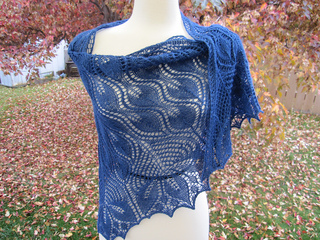 Evolutionary has counted the stitches and been kind enough to let me link to her page where you will find the details.